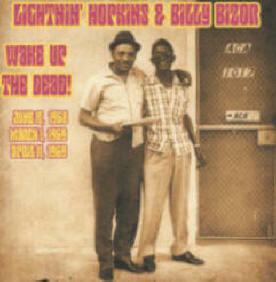 Lightnin' Hopkins woke up The Dead when he played San Francisco in the 1960's and his song "Wake Up The Dead" is the centerpiece of this two and a half hour journey into the electrified world of Texas blues. Accompanying Lightnin' on this journey is his long time harmonica player, Billy Bizor. While Lightnin' had a prolific recording career, Bizor's stature is relatively obscure due to the lack of solo recordings he released during his lifetime. Fortunately, "Wake Up The Dead" seeks to rectify that situation by including the complete June 17, 1968 session with Lightnin' and Bizor, plus all of Bizors' 1969 solo recordings. As an added bonus, the rest of the April 11,1969 session that could not fit onto Lightnin's "Shootin Fire" album (CICD-41169) is included on "Wake Up The Dead". The highlight of this session is the nine minutes of outtakes of "Mojo Hand". Never before have the complete tapes from all the aforementioned sessions been released until now. Furthermore, the tapes have been remixed from the original three and four track masters to accentuate the magical chemistry between Lightnin' and Bizor.